OK, so nothing definite, but great to see the local council and businesses being involved from the start! And substantive updates on Bathurst SC recently? In time for the 1000 maybe? Any chance this supercharger will be done before I drive to Dubbo on 8th Aug? I spoke to someone at the Sydney SC today who said work had started on Bathurst, estimated November completion. Oooh... physical construction work? Do we have any Bathurst locals who can scout around for it? The strange thing is that there are no recent development applications that match. My trust level with the guy who told me is between 80-95%. DAs can be hit or miss. Some go live and don't get a mention, some (like Keith) have a years worth of council agenda updates! I wish I'd known that on the weekend - I drove through Bathurst and would have had a look for it! Anyone know the offical address? Anyone know the offical address? A shame it won’t be ready to go for the race 5-8 of October. Any news? I would have thought this would need to start in the next few weeks to be completed this year, unless they put a sled which seems can be done in days like Horsham (obviously a lot of background work before though). I was just thinking about this. Been waiting for it myself. The Bathurst DA tracker doesn't seem to have anything relevant. The council minutes for a meeting held on 15/11/17 refer to a confidential closed section of the meeting to discuss an Electric Vehicle Charging Station and reason for confidentiality was commercial nature of discussion (which is similar to what has happened for some other superchargers). The later section notes "This report relates to the commercial information pertaining to the installation of a supercharging station in Bathurst." (emphasis added). If it is on council property, then I am not sure whether it would necessarily need a public DA process so could move fairly quickly? The visitor information centre might make sense (as per Goulburn)? I've been occasionally monitoring Bathurst's DA listing page and haven't seen anything come up. Didn't occur to me that on council land they could just decide in session and that was that. Either way, I can't wait for this SC to be up and running, I head out past Bathurst a lot, and have to rely on slow charging at Hydro at the moment. If you have a 3ø portable charger you can charge at the Bathurst Showgrounds - still only 32A 3ø, so max 70 km/h in a facelift car with upgraded chargers or 100km/h in a dual charger classic - but maybe more convenient than the Hydro. There is also a destination charger a little out of town at Abercrombie house. Thanks I'll give them a try next time. I have previously charged at Dubbo showgrounds, and have added it to PlugShare. Also, Orange now has a destination charger at a cafe. It's getting easier, that's for sure. Of the 9 options on the poll in that article, 71% of votes have gone to the Bathurst Visitor Information Centre. It looks like it only has parking for about 16 cars so they probably wouldn't want to give up 4-6 of those? 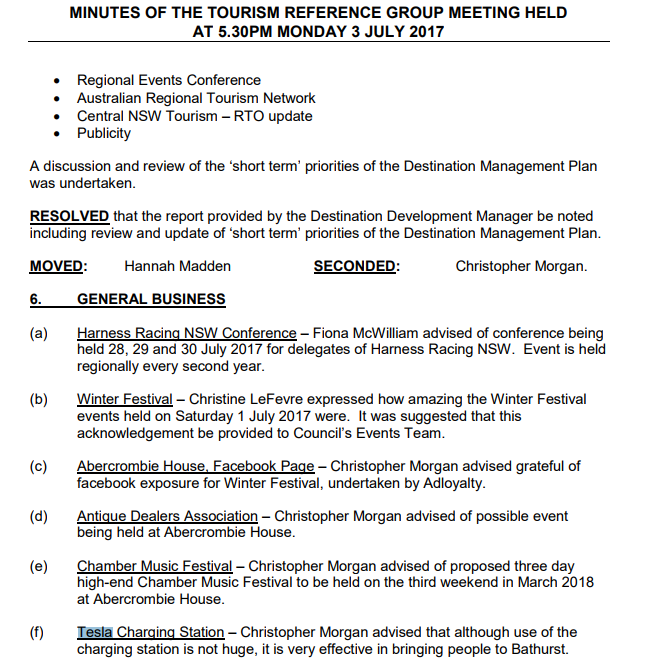 Looking through the Bathurst council minutes of 15th November... in the main minutes, there is a reference to an "electric vehicle charging station" which was discussed in closed session for commercial reasons - this is what the article above is based on.